Home Good Deals Cross Country Cafe Wacky Wednesday Weekly Coffee Sale! Cross Country Cafe Wacky Wednesday Weekly Coffee Sale! The new Wacky Wednesday Weekly Coffee sale is back again with more delicious Kcups on sale! Yes, that’s right, in case you did not hear…the famous Wacky Wednesday coffee sale is now the Wacky Wednesday Weekly coffee sale! 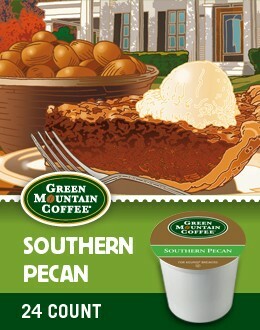 Green Mountain Southern Pecan Keurig Kcup coffee is on sale for $11.99 per box of 24 for an entire week! A buttery, nut flavored Kcup coffee! This Keurig coffee is a light roast flavored coffee lovers dream! Twinings African Red Rooibos Keurig Kcup tea is on sale for $9.99 per box of 24 for an entire week! Twinings African Rooibos Keurig K-cups are chock full of antioxidants. Naturally caffeine free with a pleasant sweetness. Don’t forget shipping is always free on orders over $59.00! Sale ends Tues., Sept. 17th at midnight EST.